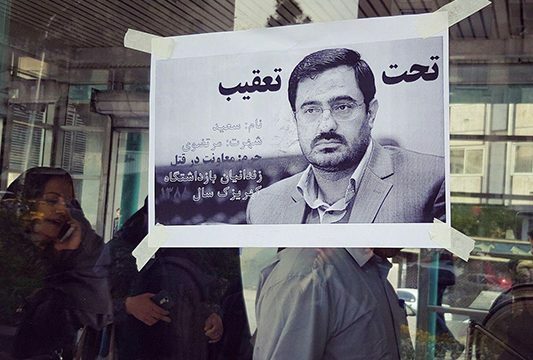 IFP- After the Iranian Judiciary announced it has yet to catch Tehran’s former prosecutor Saeed Mortazavi, activists have printed wanted posters and decorated the city’s walls with them to find the notorious judge convicted of complicity in the death of prisoners. The reformist daily newspaper Ghanoon wrote on Monday that undoubtedly, the poster initiative is not to find him; it is rather a way to express the public demand for the arrest of Mortazavi in a sarcastic way. Ghanoon also warned that if the national warning is not heard, one cannot expect to have a democratic and, of course, Islamic society. According to Arman, the Iranian MP has assumed that those who can apprehend Mortazavi know where he is. According to Iran’s Judiciary, Tehran’s former Prosecutor Saeed Mortazavi who was supposed to serve a two-year prison term is nowhere to be found. Earlier, Iranian Judiciary Spokesperson Gholam-Hossein Mohseni Ejei said that a court verdict calls for imprisoning Mortazavi for two years, but unfortunately he has not been arrested as his whereabouts are not known. President Hassan Rouhani’s media adviser Hesamoddin Ashna had also warned on April 13 that Mortazavi might want to evade justice. Mortazavi has been sentenced to two years in prison for complicity in the death of a prisoner in Kahrizak detention centre following the 2009 post-election unrest in Iran.